Today I’ve been staying a little closer to home and I’m happy to report that yesterday’s good weather has continued! 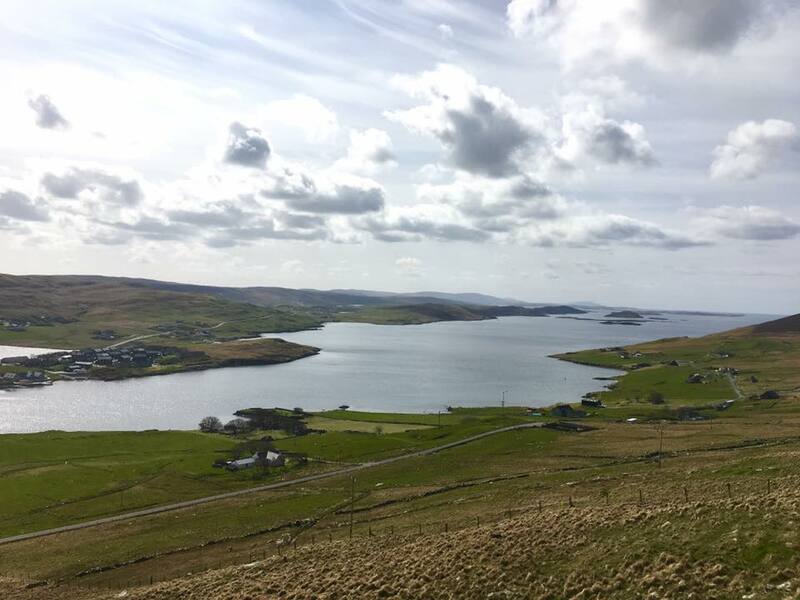 When asking folk where good views were in Shetland someone (I can’t remember who!) told me a drive to Walls in the west was worth a go as it has some stunning scenery. Well today’s first concert was at the Wastview Care home in Walls and wow, what a commute to work it was! 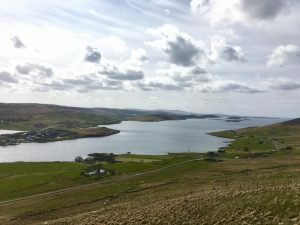 The drive took me high up into the hills with stunning vistas over to lots of small western Shetland isles. The Care home itself had a stunning view too so it was rather tempting to just stare out the window! I had a lovely concert though and was pleased that a representative from Total came down from Sullom Voe to see how I was getting on. 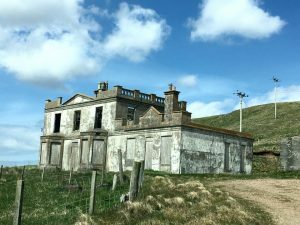 I’m so grateful they decided to sponsor the tour and that they’re popping up at my concerts to see how their money is helping people in care, in the Shetland community. The second concert of the day was just around the corner from where I’m staying in Lerwick. 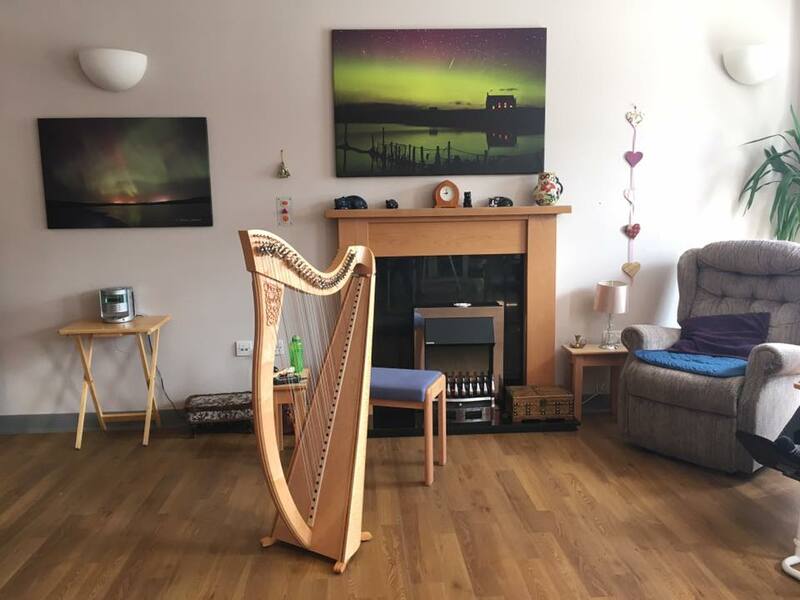 I’ve been very lucky to be staying in a stunning house in the centre of Lerwick and a house that came with a harp! Thank you so much to Dawn and Robbie for letting me stay at your place. It’s so homely and having use of kitchen has meant I’ve been able to make my sandwiches each day, which is just as well as it’s not been the easiest to find lunch places when out of the main town here! 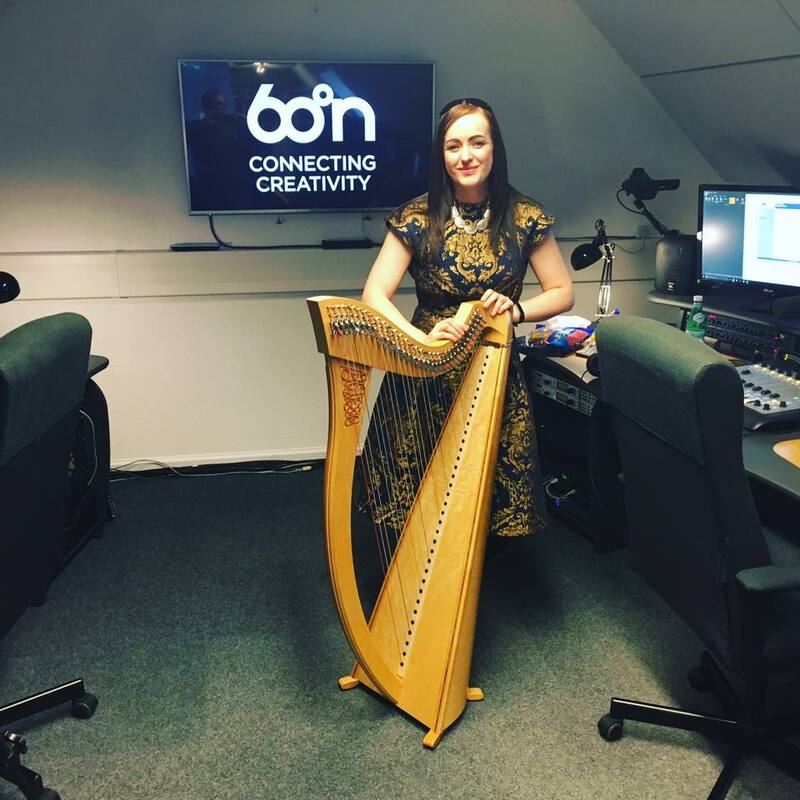 Dawn has also let me use her beautiful camac aziliz harp for the concerts which has been lots of fun to play and just having a harp already made traveling to the islands so much simpler! So yes, concert no. 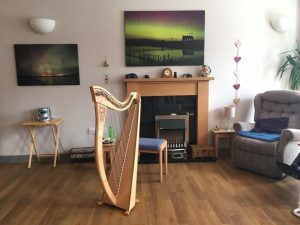 2 was at Montfield in Lerwick (picture of Dawns harp above at the Care centre) and I think this was definitely one of my favorite concerts to play, mainly down to one resident named Bobby. When I came in he was “very disappointed” to see it was a harp that I took out of the case and not an accordion! We had a bit of a laugh about it and through a pre concert natter I discovered he’d once been a fisherman, and also a keen fiddler with many a tune under his belt. He really enjoyed the concert and particularly when I threw in some local Shetland tunes which he remembered playing well. 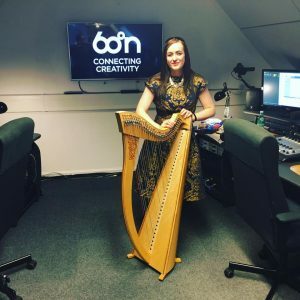 After the day playing at concerts I popped in to play a few tunes and have a chat to www.60north.tv presenter Tom Morton about the work that music in hospitals do and about my career. If you want to listen in it will be broadcasted on the website live on Saturday and then archived afterwards. I’ve not really done many extra curricular activities. Oh apart from finding an ace coffee place (Fjarå Cafe Bar) in Lerwick that I’ve started frequenting for take our coffee first thing in the morning!! I’ve also noticed that there’s a good number of creepy looking abandoned houses on Lerwick and I found a particularly spooky one on my way back from Walls! I’m currently sitting in the house and keeping an eye on the puffin and cliff cams on 60norths webcam page. The puffins are still out at sea but should they return before sunset (which is really rather late here!) I’m going to hot foot it down to Sumburgh head to see them.